Mario Batali’s What I’m Drinking: Is the celebrity chef the world’s worst cocktail writer? This man thinks it’s OK to shake a Manhattan. The front of the book of the New York Times Magazine features The One-Page Magazine, an arrangement of micro-articles prominently including a regular Mario Batali column called “What I’m Drinking.” Given the standards of the Times, I’ve always presumed that Batali, despite his many obligations as a famous chef, writes his blurbs about wine and mixed drinks all by himself. Given the quality of the most recent dispatch, however, I am starting to wonder whether they are ghostwritten by an assistant who is trying to get fired in order to collect unemployment. Mix 6 ounces of Havana Club Añejo rum with 4 tablespoons honey and the juice and grated zest of 1 grapefruit in a shaker. Fill two-thirds with crushed ice, and shake for 20 seconds to create a foamy head. Strain into 2 small juice glasses, and raise a toast to Papa Hemingway. It is as if Batali were bent on provoking both the impotent frustration of novice bartenders and the powerful condescension of seasoned pros. These instructions counsel the general public to use contraband rum and inconsequential grapefruit zest to produce two inelegantly large servings of an unpalatably sweet beverage that Ernest Hemingway, a diabetic, would not have dared to consume. Taking one for the team this weekend, I had my barman do his best to approximate the recipe’s idiocies. The best thing that he, tasting the mess, had to say for it was strictly conditional: “Well, it could be good”—if, say, it involved some lime juice, much less honey, and a rum he could legally sell. The fiasco of the grapefruit honeysuckle is hardly out of character for the column. If, measuring the poverty of Batali’s mixological judgment, we calibrate our scales to size up both the prominence of his platform and the brevity of his statements, we will see that he is clearly, word for word, the worst drinks writer in the United States. Some might call the column the worst thing that Batali has ever done, but that’s arguable. Is writing “What I’m Drinking” more morally reprehensible than stealing tips from waiters? Yes, probably. 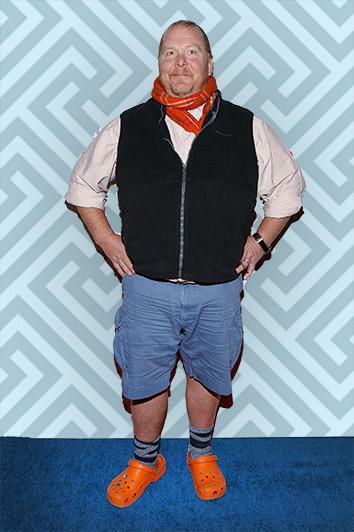 Is it more offensive than Batali’s preferred footwear? No, not quite. Herewith, a look back at some notable faux pas, rated according to their offensiveness on a scale of zero-to-five orange Crocs. The complaint: Never mind the fact that a julep requires crushed ice. Putting fruit and sugar in Pappy Van Winkle is roughly akin to putting a moustache on the Mona Lisa—an attack on the values of Western civilization. The complaint: Again, an all-booze drink such as this should be stirred, not shaken. The Carousel Bar should consider filing a defamation suit. The complaint: Skim milk, ew.